We have seen a good number of trams running around on the streets of Volgograd, but I did not really had the time to take many and good photos of them, just quickly snapped a few without having the time to wait for them to be properly positioned and photographed. Here a few of my shots anyway. 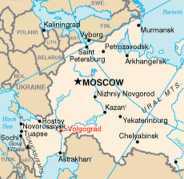 The Volgograd Metrotram is a light rail system operating in Volgograd, Russia. It consists of 18 stations on one line, paralleling the Volga River from the northern suburbs of Volgograd to its downtown core for a total length of 13.5 kilometres. Most of the Metrotram line shares a surface-level right of way with a previously constructed railway line for 10.2 kilometres, in a manner similar to that of the south leg of the C-Train system in Calgary, for example; the three downtown stations, on the other hand, were built underground over a total length of 3.3 kilometres, meeting design standards consistent with existing Russian metro systems. 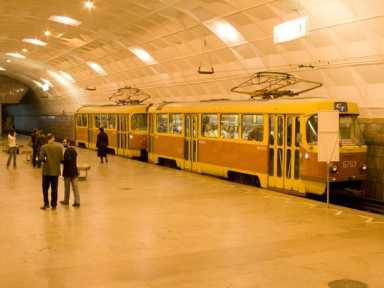 The Volgograd Metrotram was inaugurated on 5 November 1984, and presently serves 50 million passengers per year. This page was retrieved and condensed from (http://en.wikipedia.org/wiki/Volgograd_Metrotram) see Wikipedia, the free encyclopedia, January 2008.